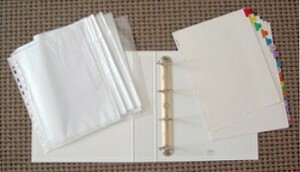 If you have a lot of magazines or newspapers you’ve been saving for one or two articles, this solution is for you: For under $20, get a nice 3-ring binder and some plastic sleeves, tear out the articles you want to save keeping only those in the binder, and toss the remaining 95% of the magazine into the recycle bin! This also works for recipes, home decor inspiration photos, shopping ideas and info on places you’d like to travel! This entry was posted in DIY, Tips and Tricks, Try This at Home!. Bookmark the permalink.